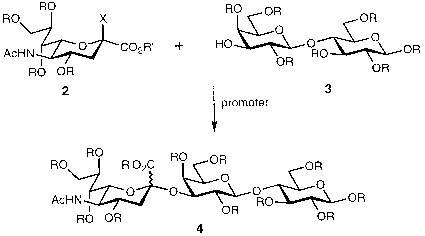 A. Optimized Leaving Groups and Activation Methods a-Glycosides of sialic acid are classically prepared by the Koenigs-Knorr  or Helferich  method, each of which involves the activation of a glycosyl halide by a metal salt and subsequent displacement by an alcohol (Scheme 6). Typically a metal salt such as silver(I) (Koenigs-Knorr) or mercury(II) (Helferich) complexes to a ^-glycosyl halide 5 to form an activated intermediate 12. This intermediate can then be directly displaced to give the product 8 or dissociate to form an ion pair 6. 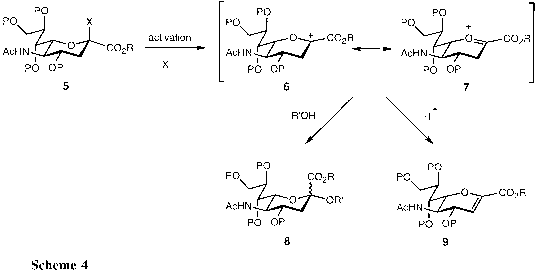 It has been hypothesized that an ion pair may block the top face of the molecule and force bottom face attack to also provide the desired a-glycoside 8. solvent polarity plays an important role in determining the mechanistic course of the reaction. One hypothesis is that more polar solvents favor the ion pair 6 because they can solvate the charged species, while the SN2 pathway is preferred in nonpolar solvents.